PASSOCORTO (length 4100mm – width 1880mm – height 1160mm – wheelbase 2450mm) – whose name itself already expresses all the character of the car, recalling its compactness and lightness – is a two-seater sports car with rear-mid engine. The interiors are designed to have two cockpits with integrated instruments clearly divided by passenger and driver; the seat is optically connected to the dashboard and the backrest is cut directly out of special niches in the frame. The model was designed to have a carbon fibre monocoque chassis, thereby ensuring the car is as light as possible (the target weight was 840 kg). On the road, it would be powered by a 4 cylinder inline bi-turbo engine (1600 cc) of 270 CV. 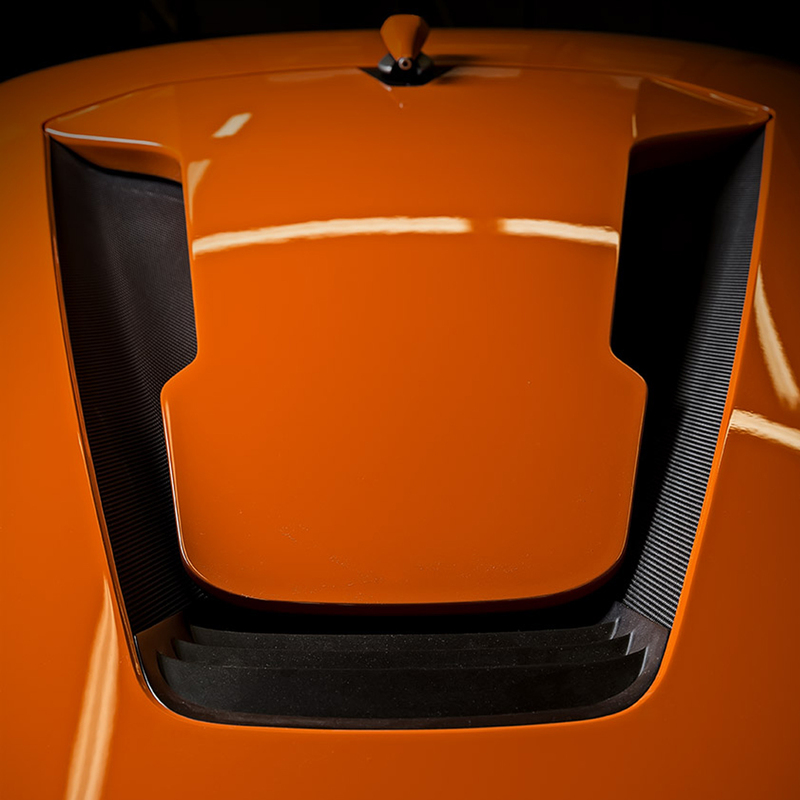 In general, the concept lines are dictated by the wheel arches, which simulate crab claws and envelop the extremely streamlined central volume of the bonnet and the cab. The front and rear are completed with significant aerodynamic elements, while the roof has a graphical setting that integrates the engine air inlets while a video camera acts as a rear view mirror and records high resolution videos to be shared with fiends on the web. 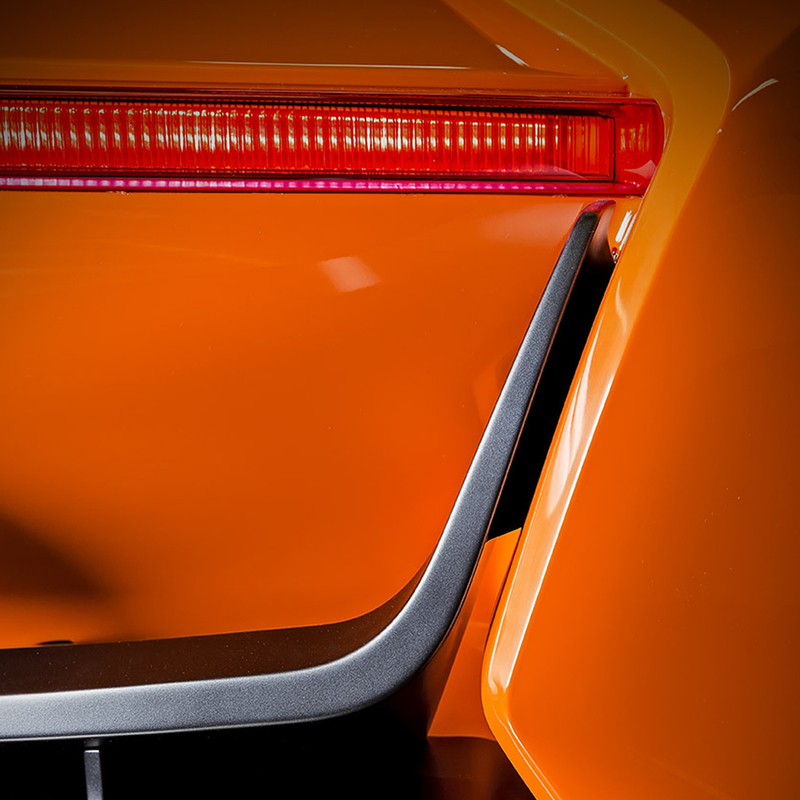 The exhaust pipes, which come out of the top part of the car, allow for a “clean” rear and are a characterising element of the design of the whole car. 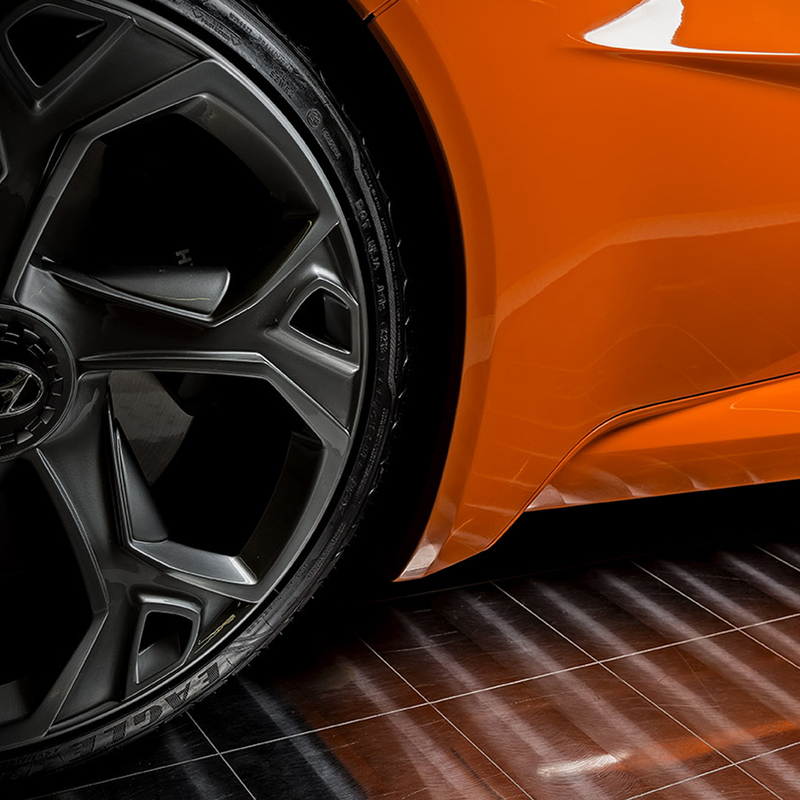 The livery dazzles in orange, which is reminiscent of the 1970s sports car traditions that made the history of great Italian car makers. PassoCorto has a very sporty profile. 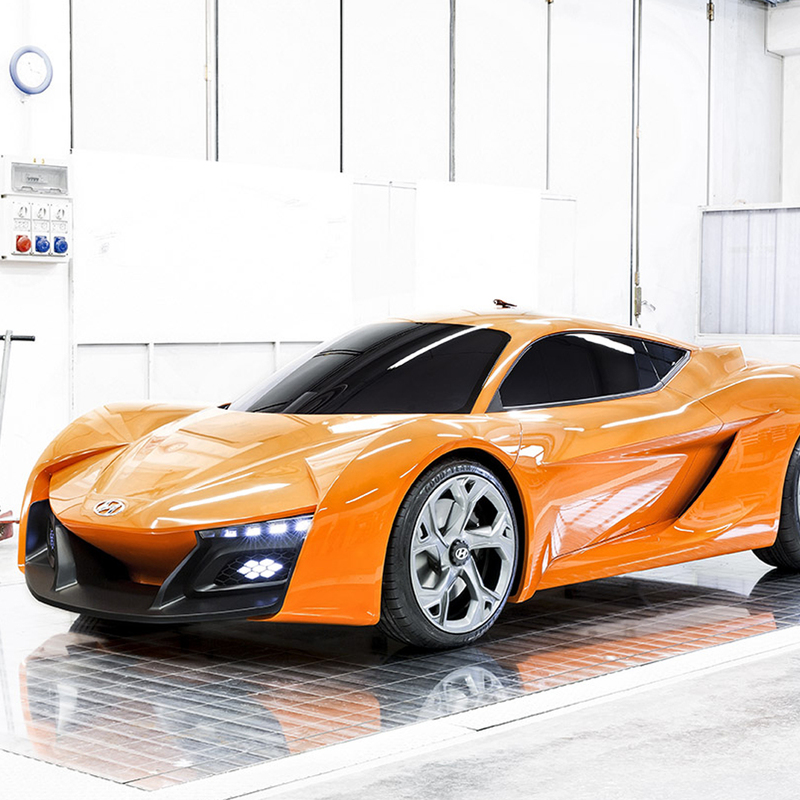 A concept car with a technical but evocative name, intentionally requested to be in Italian by the Hyundai Design Center Europe as a tribute to the Made in Italy design that is studied at the IED. PassoCorto, the tenth full scale model created by Istituto Europeo di Design of Turin, is a sports car, extremely compact in size. Designed by the Master in Transportation Design – work experience IED Turin – a.y. 2012/13 in collaboration with Hyundai, it will be revealed in world preview at the 84th International Geneva Motor Show. The Korean car manufacturer gave to the Institute a design brief with its target potential customers being those born between the eighties and the early years of this millennium: the young people who are always connected, those of 2.0, known as generation Y. This very target market also includes the students on the Master’s asked by Hyundai to draw and design “the car of their dreams”, one that would be top of their list for buying and driving. The car designers therefore put themselves into the shoes of automotive professionals and also the potential purchasers of their own design. This is how the PassoCorto was created, in a year – 2014 – that, in addition to the tenth full scale model, will also see the Institute celebrate 20 years of the Transportation Design course and 25 years of activity in the region. 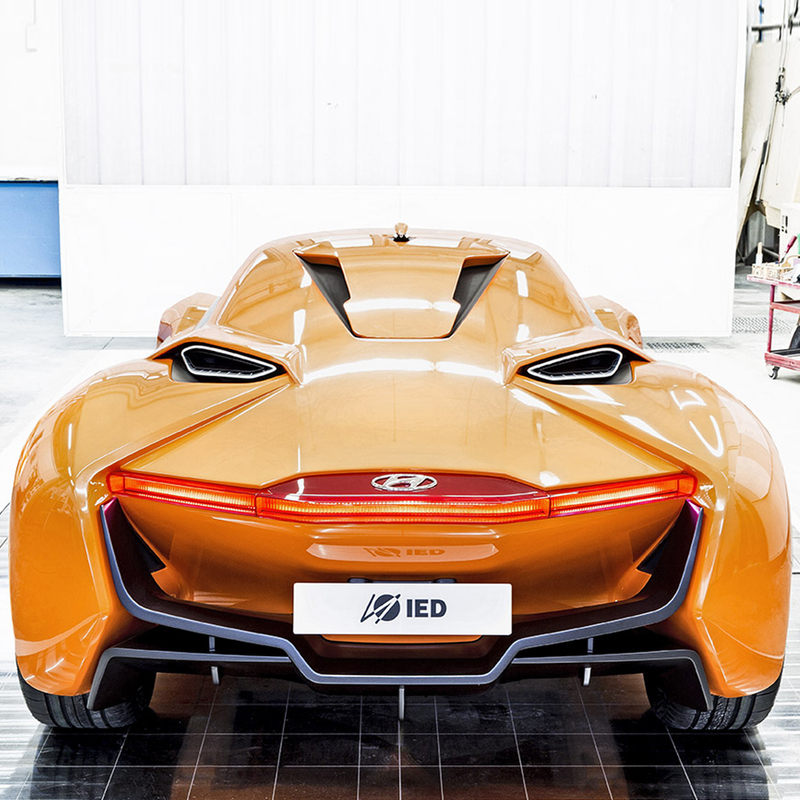 IED collaborated with Hyundai seeking to focus as much as possible on the emotional factor linked to the passion for cars. The client’s role was crucial both in the approach to the project and in managing to stimulate the students, reawakening in them real and tangible passions, which often seemed sedated by their digital experiences. Even in the design modus operandi, Hyundai insisted on returning to more traditional methods, giving great importance to manual design and clay modelling. 3D digital was used only and exclusively for the full scale development of the chosen model. PassoCorto is the work of sixteen students on the Master’s course coordinated by Luca Borgogno, Lead Designer Pininfarina. The concept is the result of a process marked by various assessment stages, simulating a real working situation. All the students submitted their own proposal; the two that were best able to respond to the initial brief were selected and “merged” together into the final version which combines approximately 70% of one proposal and 30% of the other. The entire class in fact created a core working team in order to create a well-integrated model of the two final versions in line with the concepts expressed by the scale models, completing as a group the full scale concept. The Master in Transportation Design – work experience has developed over the years as a highly qualifying training course which prepares competent automotive professionals, able to succeed in the world of work thanks to a constant relationship with companies and style centres. The students actually personally oversaw all phases of creating the model at Cecomp, a leading company in the production of models and prototypes, which has worked alongside the European Institute of Design for years in prototyping processes. PassoCorto was conceived by:Eren Birben (Turkey); Ke Wang (China); Marco Gianotti (Italy) and Chaitnaya Nitin Pise (India), Varun Awale (India); Giresh Baraya (India); Stefan Bordignon (Brazil); Doosung Jeon (Korea); Tank Harshad (India); Siddharth Prakash (India); Madhavendra Singh (India); Denis Tarelkin (Russia); Arthur Godfrey Mugisha Tumushime (Zimbabwe); Abdul Sater Wafai (Syria); Lei Zhang (China) and Andrea Zuanni (Italy), students of the Master in Transportation design at IED Turin a.y. 2012/13. Other contributions to the project: : Luca Borgogno, Lead Designer Pininfarina with the collaboration of Alberto Filosi; Luca Dazzan; Alessandro Belosio and Matteo Krzanowzky, Professors at the Istituto Europeo di Design.